I love when I get emails from people with whom I have connected. 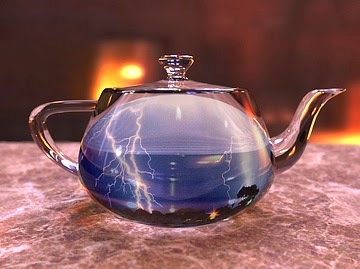 Just recently I opened my email and discovered an email from a new friend from Toronto, someone I met on my recent trip and who provided a great deal of wisdom about the difference between crises and tempests, and how to tell which one exists in your teapot. Young lady, you have disappointed me. Your recent article was very nice but you left out the most important thing I said. Do you remember I asked you about your legacy? Ack. Indeed I had left out a very important part of the conversation. You see we had been discussing the current states of our communities, and the future - and he had asked what I wanted my legacy to be. He didn't mean my financial legacy, but what I wanted to be remembered for after I had left this community in whatever form that leaving one day takes. He wanted to know how I wanted to be remembered by those I touched - in fact he suggested every single person should ask themselves about their legacy. Do you want to be remembered as someone who was persistently negative or argumentative, or as someone who saw issues and worked towards solutions even when it was difficult? Do you want to be recalled as someone who worked to improve the community for others, or as someone who did nothing except the bare minimum required to exist? Do you want to be remembered for the good you did, the things you built and changed, the ways you contributed? Then, my friend suggested, you have to do something because legacies are not built on doing nothing. He suggested those who do nothing leave no legacy behind, while those who are negative or difficult leave a legacy others would rather forget. And he had another point, too. He suggested we each need to worry about our own legacy, and not that of others. He suggested that if every person looked at their own actions - in an honest and reflective way, through a lens of objectivity - the world would be a better place because they would see the legacy they are building. 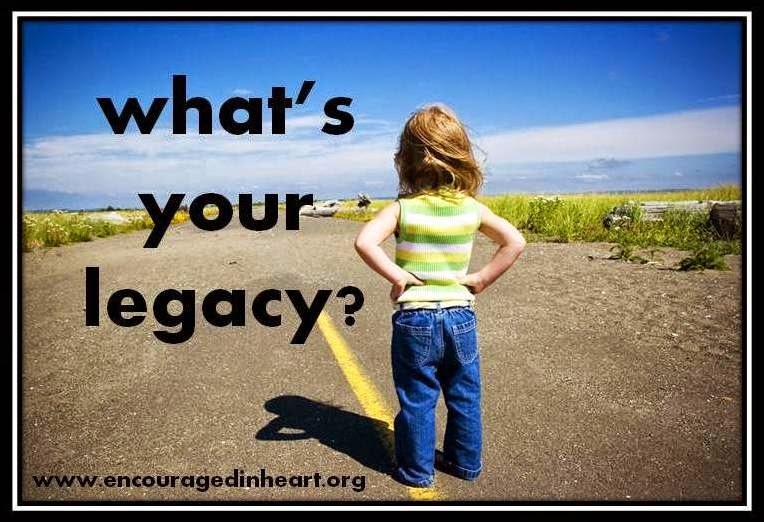 He said far too many people worry about the legacy being left by others - politicians, athletes, celebrities, etc - and far too little about their own legacy. The legacy did not have to be big and grandiose, as perhaps it would only be remembered by a small number of people, he said - what mattered was not how many remembered you, but how. It was a sobering email, and he was, of course, quite completely right in that I had forgotten this part of our conversation and had been so focused on the legacy of others - the tempest in the teapot - that I had stopped thinking about my own. Once again his wisdom re-centred me and started me thinking about my own legacy, and how I want the others in my world, whomever I touch in my life, to remember me. I know this too - my new friend has left a powerful legacy in my life, and has now touched the lives of those who read this blog as through me his wise words have reached an entirely new group of people. That, my friends, is one helluva legacy. If you have been on social media recently you have seen it, particularly on Twitter. 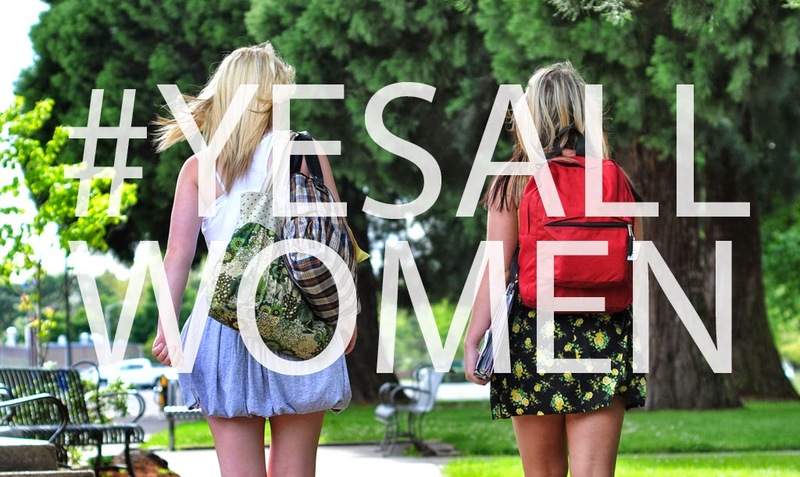 The "yesallwomen" hashtag arose in response to the recent shootings in the United States where a young man focused his rage and hatred on young women, and went on a murderous rampage, ending in the deaths of several innocent victims before taking his own life. He blamed his actions on the women who had rejected him, blaming them for his rage and his decision to take the lives of others. "Yes all women" was a grassroots reaction to his actions, and to violence against women in general. To be honest I didn't give it a great deal of thought initially. I have been quite fortunate in this regard, never having been subjected to direct violence or intimidation based on my gender. Or at least that's what I thought until I spoke to a fellow writer recently who happens to be male. That last one hurts to even type as it was the kind of nasty vitriol one never expects to find lurking in your email inbox, and yet there it was one day. My male writer friend was stunned into silence. He asked if I realized he had never - not once - been attacked in a manner based on his gender. His views and opinions, yes, but even then the level of nastiness was nowhere near what I had experienced. It was a learning moment for both of us. As we discussed more I learned he had never been stalked, had never had to speak to the police about frightening emails or messages, never feared for his personal safety, never felt he had to protect his address or phone number, never felt he was being targeted because of his gender - and yet I had felt and experienced all these things, and so had many, many of the other women I know who write. Perhaps the worst part for me, though, is the suspicion that some of the nastiness I have experienced came from other women. While on occasion some of it has been from men I think much of it has arisen in my own gender, women who for whatever reason feel given to saying horrendous and cruel things to other women. Perhaps we are our own worst enemy, I wonder. But it has happened with men, too, like the ones on Twitter who learned of my daughter's admiration for Justin Trudeau and who dismissed her opinion as foolish because she is young - and female. I was outraged by this, that they felt they could attack her based solely on her age and gender, as if her thoughts and opinions did not matter because she is a young woman. And I suppose as I thought about it I realized that yes, it is all women. I suspect all women have experienced some degree of this, although not necessarily at the hands of men but simply at the hands of those who attack based not on our opinions or beliefs but on our age, the colour of our skin, our religion, our country of origin, and yes, our gender. And perhaps it is not as simple as "yes all women" but "yes all humans". So, yes, all women. Yes, this has touched my life, particularly in the last few years, and yes, it has already touched my daughter at the tender age of fourteen. And that is why "yes all women" matters and why it is important to understand - because I want the world to be a better place for her and for all other young women and men, a place where they can express themselves and know that they can do so without fear. Yes, I want it better - for all of us. Three AM has always been my nemesis. It is the time of morning when I awoke every night for a year after my mother’s death, jolted into alertness by wrenching abdominal pains that appeared like clockwork. It took some time to determine that the pains were caused by grief and not physical illness, but 3 AM has become the number on the clock that has always tormented me because whenever something is troubling me I always find myself awake at that time. For the past two years 3 AM has taken on a new significance, because twice now it has been the hour when I have found myself alone in the dark, huddled in a sleeping bag with fuzzy socks on my hands to ward them from the cold, trying to sleep on a hard metal bench or the damp ground. 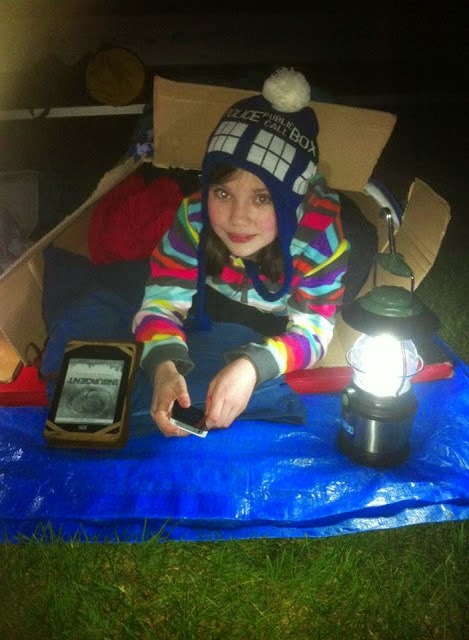 For the past two years, you see, I have spent one night sleeping outdoors as a participant in Hope in the Dark, the homelessness awareness event hosted by the local Centre of Hope. I have had the good fortune to spend time with some of our local homeless population. I have learned some incredible lessons from them, and not just the value of fuzzy socks for keeping your hands warm when the nights have turned cold. I have learned of the fine line between being homed and homeless, and the community that the homeless create on the streets to help each other endure an existence that can be, at times, brutal. I have met homeless individuals who have been homeless not for months, but years. 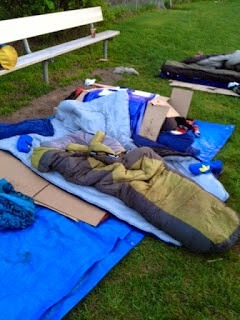 I have met those who have slept in tents when it is 30 degrees below, and during our harshest seasons. I have met those who are homeless due to substance abuse, mental illness and physical injury. I have met a broad spectrum, elderly adults and youth not much older than my own daughter. And it has changed me. A couple of weekends ago I was in Toronto. One evening the Intrepid Junior Blogger and I walked by a pile of blankets sheltered in a doorway. All we could see of the tenant of the blankets were two hiking boot covered feet - and a sign that said "pregnant and homeless, please help". It was a wrenching moment. The IJB looked at me and said: "That's so sad, what can we do? ", and I looked at her, my baby, and told her that I would think about it. I remember being pregnant, you see. I remember the joy and the fear and the excitement. I can imagine those feelings all over again, but one thing I cannot imagine is being pregnant and homeless. And so very early the next morning while it was still dark and while the IJB slept, I went back to that doorway and left a bag of healthy food near the blankets, fruits and vegetables and meat for protein. I hope the occupant found it when she awoke, as it was the only gesture that made sense to me, because I felt so very helpless and yet I knew I needed to do something. You see that is what the Centre of Hope and Hope in the Dark has done for me. They have made me see things I did not see before, and the things that far too many of us walk right by, the hand-lettered signs and the piles of blankets. They have made me realize that while I alone cannot solve the problem of homelessness I alone can engage in small acts of kindness that may make a difference in the life of one homeless individual. This weekend on the same evening as Hope in the Dark our community will celebrate a milestone and achievement with a glittering gala event. I attend a lot of those in this community, and they are wonderful affairs, and so truly worthy of recognition. My favourite annual event, though, is one far from red carpets and Jimmy Choo shoes and swanky décor. It is an event that takes place in a park downtown, where the IJB and I set up camp and settle into our sleeping bags tucked inside cardboard boxes. I watch as she sleeps, the baby I once carried inside me, and I think about that fine dividing line between us and the homeless in our community. And there is a moment, around 3 am, when clarity hits me, just when the skies above are filled with shimmering stars and the stark truths of life assail me. This year I will probably think about a homeless woman in Toronto sleeping in a doorway. I hope she found the bag of food I left and I hope she saw it for what it was - a tiny bit of hope in the dark. Sometimes you get the pleasure of being part of something from the very beginning and watching it grow. The experience is often an incredible one, especially when you see something go from being a small nugget of an idea to a huge success, impacting lives along the way. And that is how it has been with Northern Elements Crew, the local hip hop group that has grown in massive ways since it began - and changed lives. Earlier this year I wrote a letter of support in the bid to nominate NEC for an award. I like to think I managed to capture the essence of what NEC is and means in this letter, and today I want to share it with you along with a video from a local event hosted by NEC. I went to the event - and it was a blast, confirming everything I have believed about NEC from the start. It has truly been my honour to watch as Northern Elements Crew has grown, developed and begun to change lives. I have a few favourite organizations in this community, and NEC ranks right up near the top for me - mostly because they always, always manage to make me smile and feel optimistic about our youth and our future. I want to thank them for all they do for our local youth and hip hop enthusiasts - and for allowing me to be part of the journey. I am submitting this letter in support of the nomination for Northern Elements Crew. I have had the pleasure of watching Northern Elements Crew from the very beginning of their journey in this community, and I would like to lend my full support to recognizing them with this award. Northern Elements Crew began last January with a core of some adult community members who have a passion for dance, hip-hop in particular. What began as a small group of adult dance enthusiasts has blossomed into a hip-hop community that has taken the community by storm, and embraced local youth with an interest in hip-hop dance and culture. grow and develop as individuals. I am pleased to say that I have now seen some of these local youth involved with Northern Elements Crew, finding a community based on their shared interest. Through the Northern Elements Crew they are finding adult mentorship, peer support and a group that is encouraging and fostering their development as young adults and citizens. The key point is that this exploration of hip-hop builds upon an interest they already hold, and is enabling them to develop connections and networks with their peers and with adults who hold similar interests. It is remarkable to see what Northern Elements Crew has accomplished in just over a year, and the potential for continued and increasing positive impact in our region is profound as they are able to welcome more youth and engage even more individuals in the hip-hop community. What is also remarkable is that these youth, particularly the ones I have been so troubled that we would lose over the years as they grew disaffected with our community, are now forging connections beyond the hip-hop group as they interact with individuals from across the community at the events where they perform. Northern Elements Crew is not only encouraging local youth in the exploration of dance but in developing connections with the community that run deeper than hip-hop and that will, I hope, enable them to find a sense of belonging in our community both in and out of the dance world. The adult mentors in Northern Elements Crew believe in capacity building, and are fostering capacity in the group by encouraging the youth to become leaders in the group, but my belief is that the skills and abilities they are fostering go far beyond the dance crew. I believe they are building capacity in these young adults to be the leaders of today and tomorrow in whatever occupation or life they choose, and that the leadership skills they are learning with Northern Elements Crew will serve them well through their entire lives. To summarize I truly believe that Northern Elements Crew is not just teaching hip-hop dance – I firmly believe they are changing the lives of these young adults, and through a shared love of dance they are enabling local youth participants to become part of the fabric of our community. Through the dedication, commitment and passion of the adult mentors in the group the young participants are finding their own and I sincerely believe that this group is quite likely altering the trajectory of some of these young lives. I look forward to seeing what Northern Elements Crew can continue to accomplish and achieve in the years ahead, as what they have founded is nothing short of amazing and I believe we will have future community leaders who will one day cite their experience with this hip-hop community as one of the guiding forces in their life. Post by Northern Elements Crew. Two days ago I wrote about the ongoing saga of Phoenix Heli-Flight and their decision to end 24/7 lifesaving helicopter medevac transportation due to an inability to secure funding - or even a commitment for funding - from the provincial government or industry. Since then I have heard a great deal more about this issue, including speaking to Paul Spring of Phoenix Heli-Flight and reading several stories about the issue. What I haven't seen, though, is a response from government or industry. It seems Fred Horne, Minister of Health, is declining to comment on this issue, passing it on to Alberta Health Services to be addressed. Alberta Health Services indicated they had not heard that Phoenix Heli-Flight was being forced to cancel 24/7 helicopter services and they would not be commenting on it further either. And so we once again encounter a government stalemate where nobody is going to say anything to anyone, least of all to the people who are most impacted by this issue: the people of this region. You know, it gets a little tiresome having to fight for everything in this region. I had someone send me an email this week asking why I felt Fort McMurray deserves such "preferential treatment" over other areas of the province, and all I could do was snort. It took the deaths of seven people, including two children, to secure a commitment to twin a highway that serves one of the most economically valuable industries in North America (and even then that only came with huge community advocacy). It has taken years of fighting to even begin to get adequate infrastructure for our growth, including new roads so we aren't stuck in traffic for hours as we are caught on the wrong side of the bridge during an accident or other traffic snarl. We are still fighting for an aging in place facility, more land for development, and more services for a rapidly growing region - a region that, incidentally, does more for the Canadian economy than perhaps any other region in the country. We could go into the numbers, how many jobs in this country are reliant on the oil sands and how much revenue is generated for our economy, but I think we all acknowledge the industry has tremendous impact on this province and country in terms of economic benefit. For years we were the poor country bumpkin cousin of Edmonton and Calgary, forgotten way up here in the north and conveniently overlooked as we got their hand-me-downs of services and goods, often too little and too late to address our issues. Never mind that the economies of those cities are hugely reliant on ours and our industry - we were just "lucky" to get anything at all. The reality is, though, that Fort McMurray has come of age. We now have two MLAs who advocate for us and with us. We have a growing sense of community advocacy, and far less willingness to be the poor country cousin who must accept being "less than" their big city counterparts. In my humble opinion the decision by Fred Horne and Alberta Health Services to decline to speak to this issue is simply further evidence of the attitude towards our region that has plagued us for decades. Does anyone think they would not speak to this if it impacted the other major centres in this province? Does anyone think they would not find a way to address this if it was Calgary that did not have night-time medevac services that could mean the difference between life and death? Or is it because we are a region that can be conveniently overlooked and forgotten, just the engine of the economic vehicle of this province and not the shiny chrome exterior? Here's the reality. It doesn't matter how much you polish the chrome and shine the mirrors. Unless you pay attention to the engine of your economy it will eventually fail in some regard. This region is the economic engine of this province and it is deserving of attention to our issues and problems, including finding a solution to the current issue raging about Phoenix Heli-Flight and their ability to continue to save lives in this region. I would like to see the stakeholders in this issue start talking, and soon. I would like to see the Government of Alberta and industry players come back to the table and begin to discuss not if this service should be continued but how they intend to ensure it does. And I would really, really like if we started to see all levels of government begin to pay real attention to this region and start servicing the economic engine of our country, before the "fasten your seatbelt" sign isn't the only one to come on and the "check engine" light begins flashing instead. That’s when these things always seem to happen, when they are least expected. And no one ever “expects” tragedy or trauma to strike, which I suppose is why we call them an emergency. They happen everywhere, and they have happened in my own life with my parents as they aged, although in their case they lived in a large city with easy access to rapid medical care and transportation. But what happens when these emergencies happen in a remote region, like a highway far from major centres or an oilsands site far from medical expertise? Who do we rely on then to get us, our loved ones, our fellow community members or our employees to the medical care they desperately need? Well, in Fort McMurray for over twenty years we have relied on Phoenix Heli-Flight, and in the last few months Phoenix improved their service by offering dedicated 24/7 Helicopter Emergency Medical Services. In order to operate these night flights Phoenix had to invest in specialized equipment, including a helicopter capable of performing during demanding situations and serving a large – and growing – region. For the most part Phoenix has shouldered the financial burden of these night flights and 24/7 operations. While they have been paid by Alberta Health Services on a fee-per-service basis and while two industry partners have contributed, along with donations from individual community members, the funding that Phoenix initially anticipated to come from government and industry has not materialized...and as a result Phoenix will be forced to stop offering 24/7 emergency helicopter services at the end of this month as the financial burden has become too much for them to bear. And I will say it right now – this cannot be allowed to happen. We live in a region that is home to an industry that operates 24/7. Added to the potential for industrial incidents requiring emergency medical intervention is the workforce that operates that industry, a predominantly male group with medical emergencies ranging from strokes to heart attacks. As a result of that 24/7 industry we also have a 24/7 community, with our highways buzzing with traffic and the potential for collisions during every time of day. The reality is that our region is unique in some ways, including a 24/7 industry and community that demands 24/7 services to support it – including emergency medical transportation that is available around the clock, seven days a week, with the equipment and professionals necessary to both do the job and do it well – and Phoenix Heli-Flight are the ones who have the equipment and professionals to do it. The residents of this region and those who work in our industry and live in the camps provided by industry are reliant on these services – and in situations where minutes do matter and where lengthy transportation delays can result in poor medical outcomes, including death. We are a region of remote communities, work camps, isolated roads, industrial sites and thousands and thousands of people for whom these night flights can mean the difference between life and death. It’s a pretty stark reality – and it is time for everyone to recognize it and come back to the table. You see Phoenix Heli-Flight has tried to secure funding from industry and the provincial government but it has turned into one of those situations where everyone acknowledges the necessity of the service but no one wants to shoulder the cost. It seems a stalemate has evolved, and the ones losing are the residents of this region, as well as all those who come to this region to work. This issue impacts a far larger group than solely the citizens of this region. We have individuals working in this region who come from across the country, and who are equally dependent on timely medical transportation in emergencies. This issue impacts those individuals and their families across the country, and so the ripple effect of the end of these services will spread far and wide. Phoenix Heli-Flight has clearly shown their commitment to providing 24/7 emergency helicopter services, but they cannot continue to do so if it is not cost-effective and if they are shouldering the majority of the financial impact. It is time for the other stakeholders – the Government of Alberta and all industry representatives – to come back to the table to negotiate a resolution to this issue and find a way to continue funding a service that is, fundamentally, essential. The cost to provide the dedicated ‎service is $7,900 per day, with most of that going toward costs for 9 pilots, 2 mechanics, and administration. It also includes a hangar and office, and fuel infrastructure, insurance, training, night vision goggles, and a $6 million helicopter. This might seem like a large amount but if compared to what our region produces in economic benefit for the province and in revenue generation for the industry it is quite clearly a drop in the bucket on the investment scale. So, what do you do and where do you come in? I happen to know that our regional MLAs have been advocating for this service and demanding that our region receive the 24/7 emergency medical helicopter transportation it both needs and deserves, so I suggest it is now time to take it higher and voice our demands directly to the Minister of Health and our Premier. The collective strength of our voices can, and has, accomplished remarkable things in this region in recent years and I believe this situation is no different. Perhaps you reside in this region and wish this service to continue. Perhaps you reside in another part of this country and work in this region. Perhaps you have family who live, work or play in this region. The reality is that if this region touches your life in any way then this issue has the potential to impact you as those emergencies, the ones that happen in the middle of the night, are never expected and we never expect them to touch our lives – and yet they do. We need to advocate for ourselves and for Phoenix Heli-Flight as they have carried the burden of advocacy for long enough. We need to contact our government representatives, our unions, our employers and anyone and everyone that we believe will benefit from continued 24/7 emergency helicopter services. We need to ensure they understand that we believe this service must continue and that we believe the small financial investment it will require from industry and government is more than compensated for by the economic power and benefits generated by this region. The reality is that we never know when one of those middle of the night emergencies may touch our life – and in this case we may lose the very service that could save our lives. Let’s make sure that doesn’t happen. Click on the links below - and let your voice be heard. Tonight I share with you a blog post from a fellow communications professional. I do so without a great deal of commentary as he sums up his case quite well and it needs little additional comment from me. All I will add is that perhaps it is time to rip off the bandaid. I have over recent weeks watched as the slow and constant revelation of new information began to poison our community. I saw it slowly sinking into our consciousness, beginning to fester like a wound where every day brought new ooze to the surface. Maybe it's time to rip off the bandaid and expose the entire wound instead of plucking away at the edges of the bandage we have wound around it. I know that allowing former employees who signed non-disclosure agreements to now speak about their experience might have repercussions which we do not fully expect or understand, but I am not certain it can be any worse than what is currently occurring in our community - a slow and steady drip of toxicity that threatens to rip us apart. The information they possess will come out over time - of that I am certain - and so any attempt to keep things under wraps seems not only futile, but foolish.